As farm owners and operators for the past 18 years ,Jim and Lorie Bolte strive to maintain excellence of their Maui growing and shipping business. Jim oversees the growing ,maintaining and harvesting of this boutique farming operation, as well as hand picking many of the flower orders. Lorie is truly hands on as receptionist, marketer, and shipping clerk along with hand selecting and arranging all of the fresh baskets. She is also an officer on the board of Hawaii Florist and Shippers Association which oversees many agricultural avenues for the State of Hawaii. 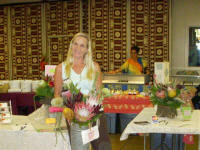 No Ka Oi Protea Farm is located in the upper elevations of East Maui in an area known as Kula. The warm days and cool nights provide the ultimate growing climate for these unusual flowers. The Bolte’s planted their farm in 1990 and continue to rejuvenate with the latest varieties available while maintaining the old favorites. 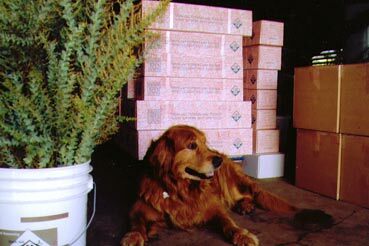 All shipment come with fast fact sheet which includes directions for keeping and drying of flowers. Gift box flowers come with water preservative to enhance their keeping power. 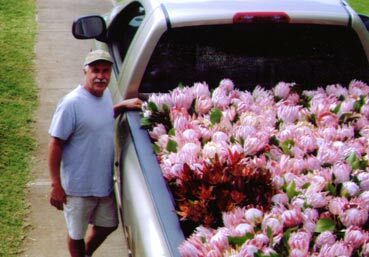 Flower shipments leave our farm here on Maui Mon. Tues or Wed. A.M. via FedEx to arrive to US destination in 48hours later. A Thursday ship out can be requested for an additional $15.00. In Hawaii there is no FedEx pickup on either Sat. or Sunday. I received one of your fresh bouquets and can’t believe how beautiful it is and how unique it is. I am so curious what each of these flowers are actually called and if you have info on each; just curious since they are so rare. Thank you! oh my! what a wonderful surprise to receive this arrangement today. so unusual and unique..and to know that not only does it lasts for weeks but can be dried to enjoy later down the road…so impressed that i will now be ordering these instead of the boring flowers available here…thank you for making a delightful day for me! What a wonderful 60th birthday gift that my friend Dawn ordered from your farm for me. I am a master gardener in Florida and I’m rarely stunned by the uniqueness and splendor of such a delightful flower arrangement. They arrived via fedex on my b’day Jan. 24th in perfect shape. Thanks for offering these rare flowers- they are pure delight. I hope to be successful drying them. My oh my….Two weeks later my Mother is still telling everyone about your “basket arrangement” that you sent to her for Mother’s Day. Timed perfectly, it arrived in glorious condition. She keeps marveling about how exotic and unique the flowers are and how beautifully arranged the colors of all the different flowers are and how they compliment each other. She was thrilled and I am so pleased. Mahalo Lorie! PS I met you at the Lahaina Civic Center crafts fair and I’m from Santa Fe, NM. My mother-in-law was absolutely thrilled with your beautiful flowers…she said they were an answer to her prayers!…she will be 90 on Sunday and just found out she has advanced colon cancer…we just want her last days filled with beauty and peace…thank you so much for helping us to do that! Lorie–You’ve done it again!!! 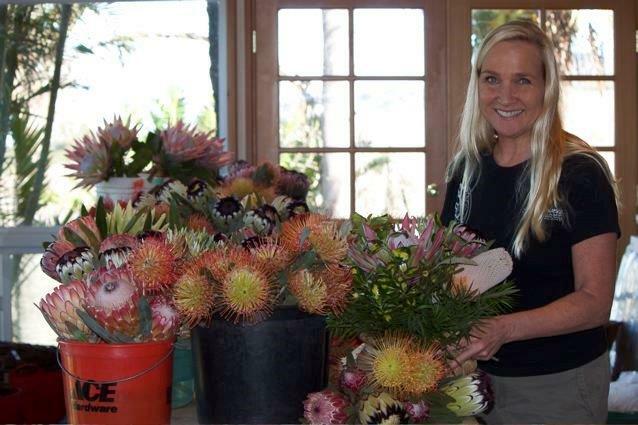 Thank you so much for the magnificent protea arrangement. You called me to say it was going out and it was beautiful. But, it is BEAUTIFUL. I keep returning because you’ve earn my trust and my business. Thank YOU!! !